WHAT KIND OF ANTS DO YOU HAVE? WHY ARE ANTS A PROBLEM? Ants are one of the most common and persistent pests found in and around homes. This article will explain how you can get rid of ants once and for all. The “secret” is using a combination of non-repelling sprays and ant bait. This approach will work on any species of ant but equally important is to make sure you treat all areas of your property. So if the ants are in the home, you’ll need to bait inside but then also treat the outside. Failure to address the outside will only lead to more getting into the home which is why most ant problems resurface throughout the year. In general, most all ant species originate from outside. Once established around the yard, its just a matter of time before they end up on the home and ultimately, inside. 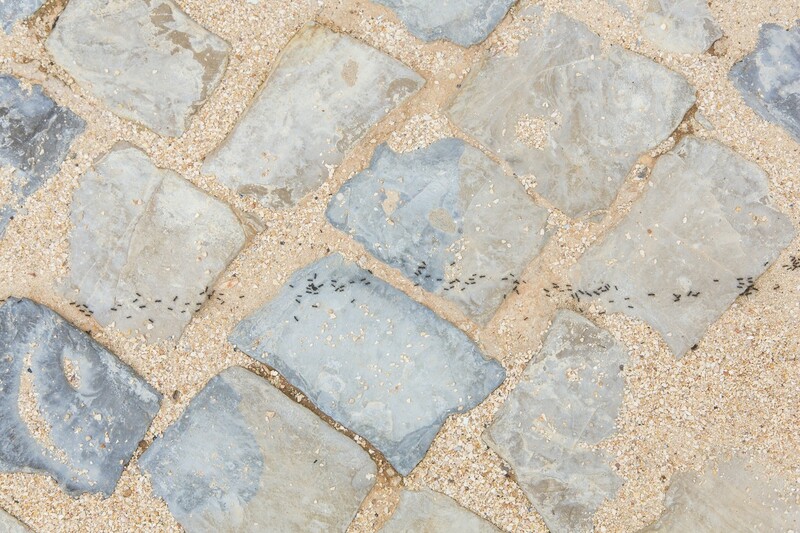 Ants will readily live under concrete, rocks and other debris and can go unnoticed for a long time. To successfully control ants, one must pay attention to all areas of their property because unlike most crawling pests, ants have a “long reach” and can be a problem inside a house even though their main nest could be hundreds of feet away. Ants come in all sizes and shapes and though we have a wide range of species here in the states, knowing the exact species is rarely important. CARPENTER ANTS can require a different set of products to control a local problem but for all other species, the process outlined below will work and get rid of them within 1-2 weeks. Now if you would like us to identify your ant, send us a sample. The most common ant species we see on a regular basis include the following: acrobat, allegheny, argentine, bigheaded, carpenter, citronella, cornfield, crazy, cut, false honey, field, fire, flying, fungus, ghost, harvester, honey, larger yellow, leafcutting, little black, little fire, night, odorous house, parasol, park, pavement, pharaoh, pyramid, red imported, red town, small honey, southern fire, thief, velvet, velvety tree and whitefooted species. Ant eat most anything organic but in general, their diets will target either protein or carbohydrate based food. This food can be in the form of what we like to eat or it could be something like a dead animal. Essentially ants are “programmed” to seek that which the nest needs. Once a target food is found, they will establish scent trails used to guide foraging workers. Once the trails are in place, they will be seen relentlessly moving to where they found their target. And though removing the active ants and food supply might slow them down, they will find something else and reappear elsewhere until they are dealt with as explained below. Ants are a problem when active around people for several reasons. The main reason we don’t want ants in the home is because they will carry a range of bacteria and germs. Like roaches, ants routinely forage around germs and bacteria. In turn they will pick some up and once in the home, they will leave some of these germs where they hunt for food. Most ants will bite if provoked and many can sting. For this reason they should not be handled. Conflict with ants is inevitable once they’re in the home and if you accidentally sit on some or find them trailing in your bed, they will get aggressive. Lastly, seeing ants in your food or on the counter is unsettling and like any other pest related problem, unappealing and offensive. Ant nests can be difficult to find. And for the most part, they can nest anywhere. In the yard, common nest sites will usually be above water lines to avoid floods. So they could be on the bark of a tree, mixed in with rocks, in a mailbox or maybe in the woodwork of your deck or fence. On the home, they’ll readily nest in the siding, around windows, around doors or under cement slabs. Once on the home, they’ll establish “scent trails” used to navigate inside. And if they find food inside, its just a matter of time before they set up new “nests”. These won’t be main nests but what we call satellite nests. These satellite nests will be linked to the main nest so even if you do find the location and kill it, more will come in from outside once the main nest learns their sub-colony has been destroyed. For this reason, there is no value in knowing where ant nests might be. This is true since so many species will have several nests and because they’ll just replenish the ones you kill if you can find a nest site, the problem will continue. In fact this scenario will play out over and over during the warm season unless you use the right combination of products and a “shotgun approach” when treating. This method will allow the treatments to infiltrate all the related nests in the network and once the actives get embedded within their related nests, they will not be able to rebound and repopulate – even if the nest is located on another property. Ultimately, if you want to get rid of all the ants on your property, you’ll have to “put a fork in it”. And to accomplish that goal, you’ll need to employ our “2 Prong Approach”. This approach will involve the use of special ant bait and ant spray. And it will involve both inside and outside treatments. For long lasting ant control no matter where they’re nesting or what species you have active, one must be thorough. SO IF YOU WANT TO GET RID OF ALL THE ANTS ON YOUR PROPERTY FOR GOOD, FOLLOW THE GUIDELINES DETAILED BELOW. For most people reading this article, the first step to solving an ant problem is to bait inside the home. The author states this because most people don’t take action until they have ants active inside. But if you don’t have any inside yet, you can proceed to the section below which discusses what you need to do outside because ultimately, controlling ants outside will keep them from getting inside. The first step is stop doing what isn’t working. That means do not apply anything purchased at your local garden center or other “big box” retail outlet. Such products might kill the ants you spray directly. But these represent a very small percent of the colony and will be replaced as fast as you kill them. Next, wipe up where you’ve been spraying to remove the contaminates and other “repellent” chemicals found in traditional sprays. Use nothing but water (no detergent) to clean all surfaces. Traditional ant spray will scatter ants which is the worse scenario possible. Ants forced to scatter will often times “bud” and form new nests which just complicates the process. Next, do not vacuum ants you see active. Instead, think of them as little “agents” you’ll be hiring to help distribute all the bait and spray you’re about to apply. So before you begin, make sure all the old spray (and old bait) has been cleaned up and removed. 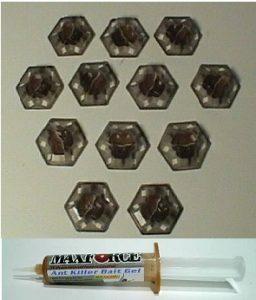 Now you can get started..
We carry a wide range of ant bait and for the most part, they’re all effective. These baits have been created for professionals so they’re tested afield and only come to market if they work. That being said, there is no need to use them all. So based on the results we’ve seen over the years, we have identified two baits which work well attracting any species of ant. But you must use them at the same time and you must make placements where you see ants foraging. These areas will be on countertops, in cabinets and along baseboards where ants are seen foraging. The first of these baits is the DUAL CHOICE BAIT STATIONS. These are well suited for both sugar and protein feeding ants. The bait contained inside is split up so that there is effectively two “flavors” inside. This means no matter what your ants want to eat, the Dual Choice will have it covered. Place stations out on countertops, in cabinets and basically anywhere ants are active. Space the stations about 5-10 feet apart and replace them as they empty. We’ve seen them get preyed upon and emptied in less than a week so inspect them daily to make sure you renew any that get cleaned out. But the more common result is to see a bunch of ants feed for 1-3 days and then back off. This is perfectly normal and stations with partially consumed bait will still work fine for 2-3 months as long as contain material inside. Sold in 12 packs, plan on placing out at least 6 stations to start. And if you’re home is large with activity in several rooms, plan on using 3-6 stations a room. The second bait to use in conjunction with Dual Choice is MAXFORCE ANT GEL. 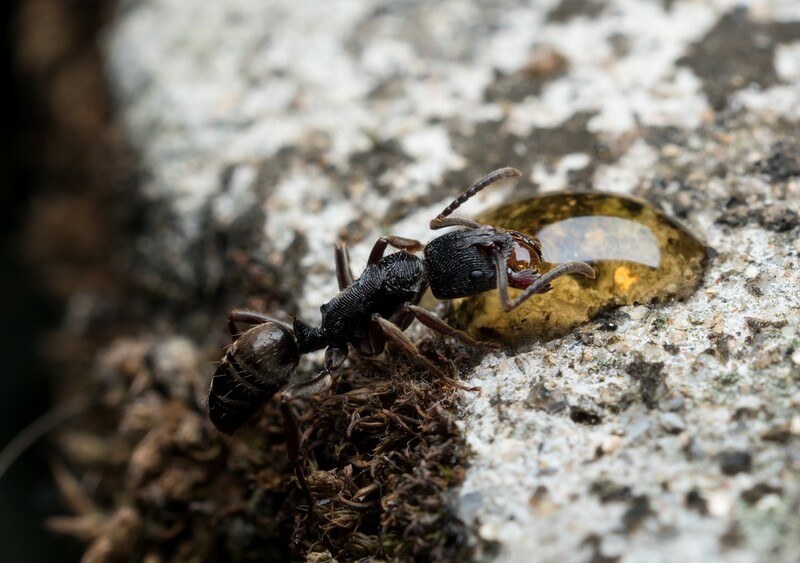 Gel baits are extra attractive to foraging ants since they’re moist. Maxforce uses a slow acting ingredient which takes 2-3 days to kick in and impact feeding ants. This ensures the bait is brought back to the nest and “shared” with other ants so that when it starts to work, it will kill many more than just the original ants which fed on it. Each tube is 1 oz and you should plan on applying 1/2 of the tube in areas close to where you apply the Dual Choice stations. Placements should be spread apart by 2-3 feet and you only need to squeeze out small dabs, about the size of a grain of rice, where ants have been seen. If they’re in the area, they will find your placement within a day or two. 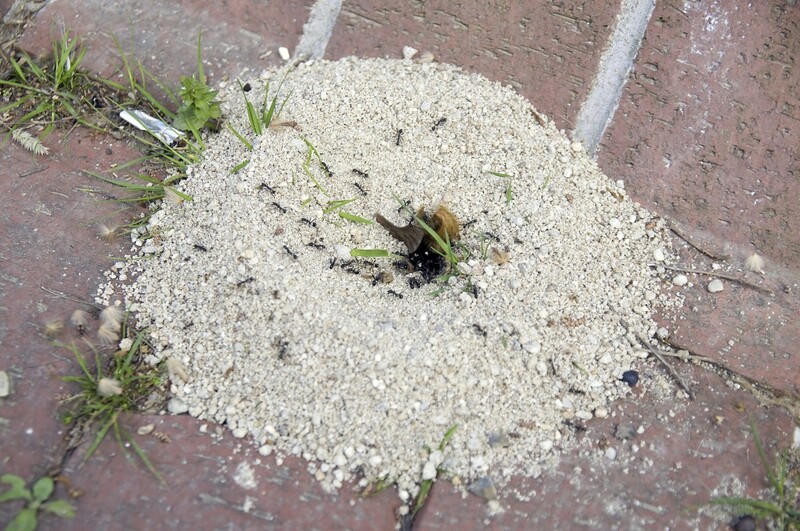 Once in place, monitor the bait daily and renew if its removed as needed until all ants in the home are gone. For more “secure” placements, use REFILLABLE BAIT STATIONS to make your placements. These discs measure just 2.5″ wide, come apart easily and will hold plenty of gel or granules. They’re not tamperproof but they will protect the bait from dust and even most outside variables like rain allowing you to keep your gel fresh longer. If you’re just getting started with ant control in your home, get the DUAL CHOICE STATION ANT GEL KIT. This combines the Dual Choice 12 pack of stations with a tube of Maxforce Ant Gel so you’ll be all set for any ant in the home. In general, the use of the ant bait above will usually be all that’s needed for inside the home. But as explained, the “shotgun” approach for treating ant infestations is best. And to use this method means treating all parts of the home even if you don’t see ants active. Often times ants will move through parts of the home unseen but if you have these areas protected, you will ensure they don’t continue to nest somewhere you haven’t baited. So to make sure you don’t miss any part of the home, either bait all rooms or spray all baseboards with the non-repellent and “stealthy” PHANTOM AEROSOL. Phantom is well suited for us on ants because it will not be detected by foraging ants. They’ll readily walk over treated surfaces, pick up small amounts of the active and eventually bring it back to the nest where it will be “shared” with other members of their colony. Phantom doesn’t work quickly; like the ant baits above, it will take 2-3 days for the active ingredient to “kick in” and start working. But by the time it starts to take effect, it will be too late for the affected nest. Remember, ants will not die when directly sprayed so do not expect to see ants roll up and die if you spray any when you perform an application. 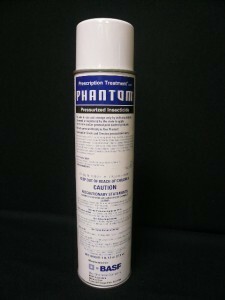 A single can of Phantom is ideally suited for treating all cracks and crevices where ants might be hiding. Treat around window frames, molding, baseboards, etc. 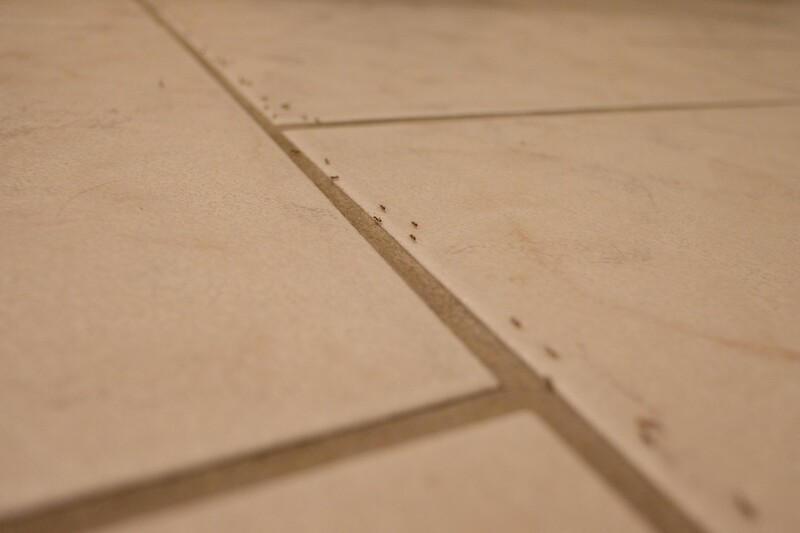 Renew treatments every 2 weeks when ants are active; treat once every 1-2 months to ensure they don’t come back inside. If you have a large home to treat and find the Phantom hard to use efficiently, go with a liquid. OPTIGARD uses another non-repellent active ingredient (like the Phantom) so it won’t spook the ants. And since its non-repelling, it won’t contaminate the baits either. Add 1/2 oz of Optigard per gallon of water and expect to spray about 1/2 to 1 gallon along baseboards, door ways and windows where ants might establish scent trails. Optigard will last longer compared to Phantom so you only need to use it once a month when ants are active. Once gone, treat every 3 months for ongoing maintenance. You’ll need a good PUMP SPRAYER to apply the Optigard and remember, its a non-repellent so make sure the sprayer you use is clean. Old pesticide, herbicide or some other spray will contaminate the Optigard and render it useless so its critical you use a good clean sprayer. Now that the inside has been baited and sprayed, its time to move outside and get ants where they originate – at the source! To start, treat the foundation of your home with the OPTIGARD listed above. And if you’re not planning on spraying inside with Optigard, use the ADONIS or SYSTEMIC RTS listed below on your foundation. 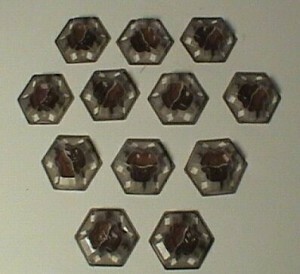 They’ll work just as well but are not designed for use inside the home like the Optigard; they’re for use outside only. Plan on using at least 1-2 gallons and spray a “band” at least 3 feet wide along the homes perimeter. This band should be 2 feet up on the foundation coming up off the ground and then at least 1 foot out coming away from the foundation. You should also treat around windows, doors, shutters, gutters and any point of entry like where electric lines enter, AC pipes, etc. Optigard should be applied once a month when ants are active; once every 2-3 months to ensure ants don’t come back. Since ants originate out in the yard before they come to your house, its imperative that you treat all grass, mulch and garden areas for long lasting control. Like the Optigard and Phantom, ADONIS is another non-repellent ideally suited for the job. Adonis will cover a large area effectively and only needs to be used every 2-3 months. Remember, the more area you cover means the longer lasting results you’ll achieve. 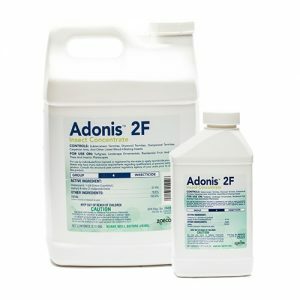 Adonis should be applied at the rate of .5 oz per 1,000 sq/ft when spraying for ants. So for a 5,000 sq/ft yard, you’ll need to use 2.5 oz of concentrate. For a 1/4 acre (roughly 10,000 sq/ft), you’ll need to use 5 oz of Adonis. Use a good HOSE END SPRAYER to apply Adonis; with our sprayer you’ll add 2.5 oz per gallon and then fill it with water to the 5 gallon line. Next, hook it to your garden hose and spray the entire amount over 5,000 sq/ft. For a 10,000 sq/ft area, you’ll add 5 oz of Adonis to the sprayer tank and fill the sprayer to 10 gallon line. If you have a small yard, say 5,000 sq/ft or less, you can go with SYSTEMIC RTS which uses the same active as Adonis. This package comes with its own “hose end sprayer” so you only need to hook it to a garden hose and start spraying (no mixing or other sprayer is needed). Systemic RTS comes in quarts and one container will treat 5,000 sq/ft. One treatment should be enough for ants but you’ll want to treat once a month when ants are active; every 2-3 months to ensure they don’t come back. The last part of the “2 Prong Approach” spray and bait program is to bait the yard once the spray has dried. Since Adonis and Systemic RTS us non-repelling actives, they won’t “ruin” bait applied to the grass, flower beds, mulch areas, etc. 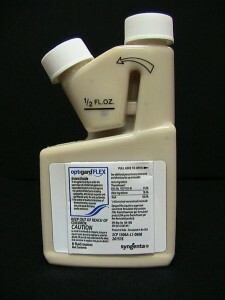 The best ant bait for the yard is MAXFORCE GRANULES. 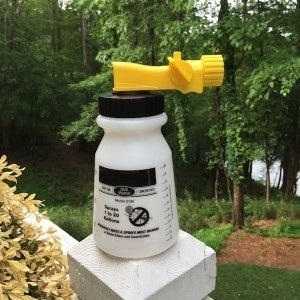 It uses a weather resistant protein attractant most any ant will find delicious. Both sizes come in a container you can use like a “salt shaker” so its very easy to apply. To treat the yard, just walk around while lightly “shaking” the container. Small amounts will come out and remember, it won’t take much to get the job done. Focus on property borders, around trees or in any area known to have ant nests. Maxforce goes a long way; use just 1 oz per 1,800 sq/ft of turf. This means for a 5,000 sq/ft yard, you’ll only need to apply about 3 oz. Use it after you spray with Adonis and retreat once every month when ants are active and every 2-3 months to ensure they don’t come back to nest. In summary, ants can be annoying and persistent once established around the home. If given the chance, they’ll readily move onto structures and form there, inside to living areas. Treating the inside with bait and spray will quickly get rid of active ants. But failure to treat outside means they’ll be back. To avoid having to deal with them inside throughout the warm season, treat the outside as explained above. This “2 Pronged Approach” of using both bait and spray inside and outside will control any type of ant and keep them controlled throughout the active season. Hi I tried Terro and combat and many other ant bait. They are all good initially, killed the nest and without ants for 2-3 months. However, when there ants again, I presume new colony, they will avoid the ant bait. The seems to know the ant bait will kill them. Now, I have tried almost 5 different types of ant bait and they refused to eat, knowing the ant bait is a poison to them. Care to comment on my situation ? This is an easy one and quite commonly happens when the only product employed is a bait. Here’s why. Most ant species colonize like a spreading fungus. When a lawn gets a fungus, it’s stars innocently enough. First there is one spot (nest) then 5-10 feet away more spots (more nests) and then 20 feet away another spot (another nest). And though these spots (ant nests) all look like they’re singular and independent of one another, in fact they’re all closely linked. So too are your ants and your ant nests. So when you first start seeing ants inside the home, what you’re actually seeing is an offshoot of a nest that no doubt originated somewhere outside the home. And those came from colonies and nests off your property, etc. And because they’re all interlinked, they all share information, both good and bad. Now when you only bait inside the home, you can no doubt influence the ants in the colony that feeds upon your offering. And yes, the bait will probably kill the colony from which the feeding ants reside. But since they’re also linked to colonies outside the home, it’s only a matter of time before the outside colony figures out something is wrong with the inside colony. And when they figure this out, they’ll send in the troops to “jump start” the old nest. But they also know not to mess with any of the food or other supplies from the now dead nest because obviously there was something very wrong with what they were eating or processing. Now if you repeat this several times in a row with different baits, the “troops” that come inside will eventually figure out they shouldn’t eat anything that’s coming from inside the home because obviously it’s poisonous. So instead they’ll rely on getting food from outside the home but live inside the home because it’s so nice and comfortable inside. Which brings my answer full circle and back to the article above. If you read through it, you’ll find we advise to spray the outside of the home with some Phantom or Optigard. These are the latest and greatest products for ant control and they work really, really well. Basically they act slowly and cannot be detected by foraging ants. And by the time the active “kicks in”, any ant exposed to the treatment will have exposed a lot of other ants to the same active which effectively shuts down the outside nests as well as any nests that have formed again inside the home. More importantly, the “troops” won’t come around anymore because now they will now believe the entire home area is poisonous! So in summary, the use of ant bait alone is a somewhat limited and flawed approach to most ant problems. True most baits will perform as per label in that they’ll kill the nest from which any feeding ant lives. But the bait won’t keep new nests from appearing so in the end, you’ll continue to have your ant problems and eventually, the ant bait won’t even work on them because they’ll get wise to what’s happening. And once that happens, the best approach is the outside spray with Phantom or Optigard followed by some Phantom Aerosol inside the house. These treatments are easy to do, pose no hazard to people or pets and work really well. And for your problem, it’s probably the only option left. 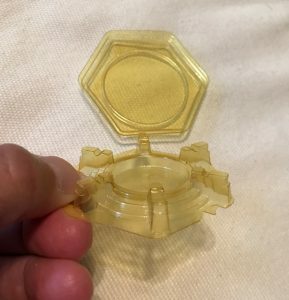 What would you recommend for ants inside already. Never see any activity outside or in until they swarm with the flyers at night. I physically removed the nest when I replaced the back door about 8 years ago. About a two summers ago I saw a little activity near the concrete stoop and put out bait. They ate, but with such little activity I did not think I got them all. Then this spring, for the first time since I removed them, the swarm came from around the inside door stop. I am guessing they are inside the wall. First and foremost, make sure they’re ants. Swarming termites look a lot like ants and are commonly mistaken as such. This video shows termites swarming and the closeups are clear so you should be able to tell if what you’ve been seeing is different or the same. Now once you know you for sure they’re ants, use the Maxforce Gel inside the home anywhere you see activity. Any ant will eat this stuff and it’s highly effective on all species. For the outside, spray the entire foundation with Phantom EC. This will work on all insects like ants and termites and even though you claim you aren’t seeing any, they have to forage for food and other nest components. So if there is a treatment of Phantom in place around the home, you’ll surely get them no matter where they move. Can the Phantom Spray be sprayed into a wall cavity with say the little plastic tube from a WD40 can? Would this be effective? They are definitely Ants. And they are definitely not foraging for food outside by any visible means near the nest. Most definitely. And a tube comes with it too. I read your article and it was very informative. The only problem is I live in a second floor apartment and I can not treat outside. I can only rely on treating inside. I was using the raid ant killer spray and doing the whole outline of my apartment inside, as well as, the windows and doors. Though the strange thing is the ants are not in the kitchen or by any of the pet food but are mostly in the living room area where is no food present. I’m using also the bait traps as well. Is there anything else I can do? I suggest you first remove any “bait trap” now out and then thoroughly clean where you’ve been spraying the “raid”. These types of sprays and baits “repel” and warn ants which in turn cause more issues. In the end, you’ll never get rid of them using these products. Once the old products are removed and the surfaces cleaned, get some Maxforce Ant Gel and Phantom Aerosol. Use these two in much the same way to what you’ve been doing. The difference will be that with these products employed, you’ll be able to get rid of the problem for sure. Here’s why. Both Maxforce and Phantom use actives ants can’t tell are a problem. In fact they’ll walk right over the Phantom treatment without concern. But once it contacts them and is brought back to their nest where it contacts other members of the ant colony, the entire nest will be shut down. This process will take a good 3-5 days to run it’s course but if you keep a fresh supply of Maxforce out and renew the Phantom every 30 days, you’ll never have any kind of any active in your apartment anymore no matter how close they’re nesting. That will happen because once they’re affected by the treatment, they will believe that something in your apartment is bad and will simply stay away from the location to avoid future mishap. We have a horrible ant infestation all around our pool area. These are the ants that smell horrible when you kill them (they call them piss ants here in California). They also have a pretty nasty bite. We’ve tried everything from granules to sprays to traps. The granules work the best, but we have dogs and the risk of them getting into it is too great. The pool area is about 1/4 acre, with ivy, trees of various kinds, misc plants, etc – all fully mature and a lot of them. There is some grassy area, but these ants don’t seem to be a problem anywhere there is grass (even on the rest of the property). Our natural ground is mostly DG, but of course the pool area has been landscaped, so there is topsoil as well. There are several large boulders that were left in place to enhance the landscape. These ants were a huge problem for the previous owners too and they pretty much ruin the pool for us as you can’t sit anywhere outside of the water without them crawling on you and biting. We have no trouble with these ants in or around the house at all. What do you recommend? This is an easy one. If you review the article above, you’ll learn that most of the products we discuss are designed to treat ants inside or alongside the home. So for your problem, the products we mostly recommend won’t apply. But also listed above is a product called Optigard. This is what you need to apply. Optigard is mixed at the rate of .27 oz per gallon of water and a gallon of mixed product should be applied for every 500 sq/ft of turf, plants, shrubs, etc. And based on the problem you described, you need to treat as much of the yard as possible. This will insure a quick impact. And you need to do this every 2 weeks until the problem is gone; once a month to keep them from coming back. Optigard is unique for a few reasons. First, its odorless so you won’t know its there. Second, after applied and allowed to dry for 30-60 minutes, people and pets can walk over treated areas with no risk or safety concerns. But most important, Optigard is “invisible” to insects. Basically they can’t detect its even been applied so they’ll readily walk over the treatment. And when they do, they’ll pick up small amounts of the active which they will then bring back to their nests and inadvertently “share” with other members of their colony. And once shared, their whole nest will die within 1-2 weeks of the treatment. So if you do a thorough job of spraying, you should be able to kill every nest associated with every ant that walks over the treatment. And the best way to apply this product is with a hose end sprayer to insure you get great coverage. It just does a much better job compared to standard pump sprayer. In summary, there is no need to suffer with this problem. Using the right product the right away will get rid of these ants promptly. So if you want them gone, get the Optigard and the 20 Gallon Hose End Sprayer and start treating. We have a problem indoors. They’re much smaller than carpenters, tiny to small in size, most of them are black. They are popping up for the first time in almost every room in “small” numbers (mostly the scout and then some from the clan, though about 25 converged on kitchen counter one night). We had a leaking roof that was repaired. Could that moisture have attracted ants even to the attic? We are having remodeling done. There are open walls and I’ve seen a few ants going up and down the studs. I’m trying to think of every area that should be treated because we’ve never had this problem before. Right now there are ants coming out of our tub surround (will be repaired very soon) from underneath the tile board. It had separated from the flange so we duct taped it “temporarily” (a while ago). 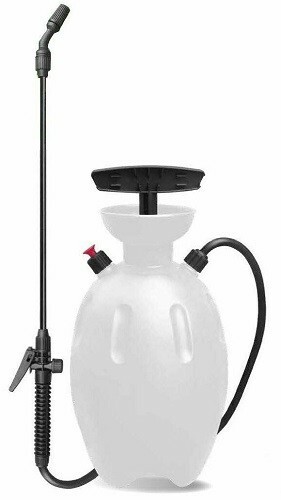 I’ve used a perimeter spray for the outdoor ants, ant bait stations in and outside diatomaceous earth and that same house guard spray indoors. My problem is the bathroom tile board has cracked open in the corner and I’ve seen ants come out for the bait which they seem to have trouble finding. I want to treat them and kill them before I rip off that tape. I’m terrified theres quite a colony, possible several. Your products helped me save 10 arborvitae trees that were dying many years ago. I am grateful for your advice. I trust you will recommend that right treatment again. I really don’t like the baits in the house. How can I get something behind that shower wall that will kill the queens too? Please answer soon. Thank you. If you review our article above, you’ll learn that its nearly impossible to kill ant colonies using the type of spray you’ve been applying. This is because as soon as your treatment starts to impact just 1-2 foraging scouts, the colony is “alerted” to the problem and will stay clear of where the treatment has been applied. Making it even more difficult is the fact that ants don’t have one nest. In fact most all species will have a series of “satellite” nests which all work together as one vast “network”. And if any branch of this network is shut down, any of the others can become the “main” or home base to replace the one that is struggling. This means even if you did find a main nest and treated it heavily, the surviving stragglers would merely relocate to one of the surviving satellite nests and start anew. And within a couple of weeks you’d have the problem all over again (which I think has already been happening based on the details of your problem). So after reviewing the information you sent and the fact that you’re wanting to avoid the bait inside, here’s what I know you can do that will work. Above you’ll see mention of a new type of chemical called Phantom. This is what you should get. Both the aerosol and the liquid form. Basically Phantom is undetectable by insects and that includes ants. So even as they walk over it, they have no idea there is any threat. Additionally, Phantom takes a good 2-4 days to start working. And it “translocates” meaning its easily transferred to members of the colony that didn’t walk over the treatment. So in the days following a thorough application, the chances are high that the majority of the active ants in your home will get exposed to some Phantom and then when it turns “on”, they will all die. This virtually eliminates the chances of any rogue ants starting anew and even if they do, the Phantom will get the new colony at some point so they can’t win. In summary, if you want them gone using only a spray, get the liquid Phantom and apply it around the homes exterior as well as baseboards inside. Expect to use a good 2-3 gallons of mixed product to get the job done. Next, spray all cracks and crevices with the aerosol form where you didn’t use the liquid. The aerosol is “odorless” and goes on dry making it ideal for use inside. This is especially true around hardwood floors, windows, doorways, etc. I expect that you’ll see positive results within 3-5 days of doing a good treatment and within 1-2 weeks, they’ll all be gone. And if you do this type of application every 2 months, you won’t get any kind of insect issue in or around the home. Jonathan, thanks for your good advice. Do you think I need four cans of Phantom spray based on what I told you? Was the other size of Phantom enough to make 2-3 gallons? Is the sprayer strong enough to handle the job? I have a Cape Cod sized house. Also, is it safe to apply to the shower walls? Can I shower in it afterwards? Is there a drying time? I will await your answer. Thank you for the very quick reply. We are at wits end. My husband believes that I am making up the multiple queen/colony fact. I’m so glad you explained clearly and concisely what is occurring. I will order today once you have determined that I need that amount. Thank you again from the bottom of my ant-fear heart! I think it would be wise to get the 4 cans of Phantom. I typically use 5-8 cans a year between my house and boat so I suspect you’ll go through at least 3-4 this year. As for the liquid Phantom; the size listed will make plenty. I believe 28 gallons at the maintenance mixture; 14 gallons at the clean out strength which is what you need to use for the first few months. Regarding your shower; treat all cracks and crevices with the aerosol form and let it dry. Unfortunately the water will destroy the spray so after 1 hour you can use the shower safely but realize the treatment will be washed away. For this reason it’s best to treat these areas late at night, before you retire, so the application gets a chance to sit overnight where it can have some kind of positive impact before you next use the shower. I have a wall unit air conditioner and I live in Florida. When I turn the air conditioner off I always see a few ants near where the air comes out or on top the case. I do not see any ants on the days that the air conditioner is off. Thankyou. I recently purchased you gecko spray and glue traps. Based on the location of the activity, I would suggest using the gel bait listed below. This will be the safest way to control the ants. 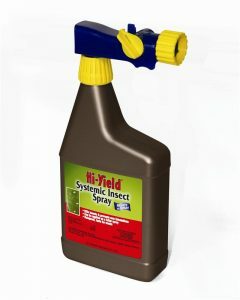 Most every species will readily accept Maxforce Gel and within 5-7 days, any nest that feeds on your offering will die. You should also apply the Maxforce Granules to the ground outside the window because undoubtedly, this is where the activity originated from. My teenaged daughter recently got bit by a winged flying ant (black) inside our home and had a severe allergic reaction that required us to take her to the ER. Now she has to keep an Epi pen with her. Needless to say we want to do all we can do to get rid of any ants that we can. We have had an ant problem in the past (not winged) with them coming inside and getting into our cat’s food and other places. We used some of your Maxi force gel bait with much success but after reading your article I see we needed to also treat the outside of our home. We have lots of trees and bushes near our house. I am not sure out of all the products you mentioned which will be the best to keep the winged ants from flying or getting sucked into our house (I’m assuming that is what happens when we run our attic fan). We don’t see many of these ants but now that we know she is severely allergic we don’t want to see any around our house. Can you please recommend a course of treatment that would best solve this for us. Thanks a bunch! Flying ants are usually a sign that a local nest close by is releasing swarmers. Swarmers are basically reproductives; males and females whose sole purpose is to go out and start new colonies. Many of these are able to bite or sting and if they land on a person or animal, they will often times do exactly that since its a natural defensive behavior. So what can you do to prevent conflict with swarmers so your daughter won’t be jeopardy? For starters, you need to reduce and/or eliminate the nests around the home. Do this by applying the Maxforce Granules to the grass, islands and flower beds around the home. Its easy to use and should be renewed once a month. This way foraging ants that find it will eat some and die before they’re able to establish new nests or trails. Next, spray your foundation with Defense or Cypermethrin. Use 1 oz of either per gallon of water and apply 2-3 gallons of mixed material around the homes exterior. Focus on doorways, windows and any route of entry. This will keep ants off the building – especially flying ants which can bypass the granules in the yard – and in turn reduce the chance of any getting inside. Lastly, if any appear in the home again, be sure to apply some fresh Maxforce Ant Gel. As you know, its great for inside the home and is easy to use.